Borderlands Books is a gem in the city: a bookstore and cafe that specializes in new and used science fiction, fantasy, and horror. If you’ve been around these parts 10 or more years, you might remember their sphinx kitties roaming the store, and a sign that told everyone when the cats were in. Though there are plenty of spooky books on the shelves at Borderlands, the staff actually discovered something quite unsettling in real life, in the newly excavated basement of the bookstore. Some of you might remember that the Borderlands Cafe was a later addition to the shop, and during construction, co-founder Alan Beatts found something in the basement that sent the crew running. Alan sends us this bonus photo of the basement. See the tree trunk on the right? It’s not going anywhere! The bookstore also serves as an inspiration of a successful grassroots business: the beloved bookstore faced a likely closure a few years ago. Amazingly, and in true San Francisco fashion, they raised $2M via a grassroots campaign to buy a building on Haight Street, where they will relocate as soon as construction there is complete. Borderlands also has an ongoing sponsorship program that keeps their doors open. This is definitely the preferred ending to You’ve Got Mail I’d been looking for. Want to hear more great stories like these live on stage? Muni Diaries Live is back on Saturday, Nov. 3 at the Elbo Room. Help us give the Elbo Room a proper send-off! Tickets are on sale now. Thanks to reader Chris L. for transcribing this episode! 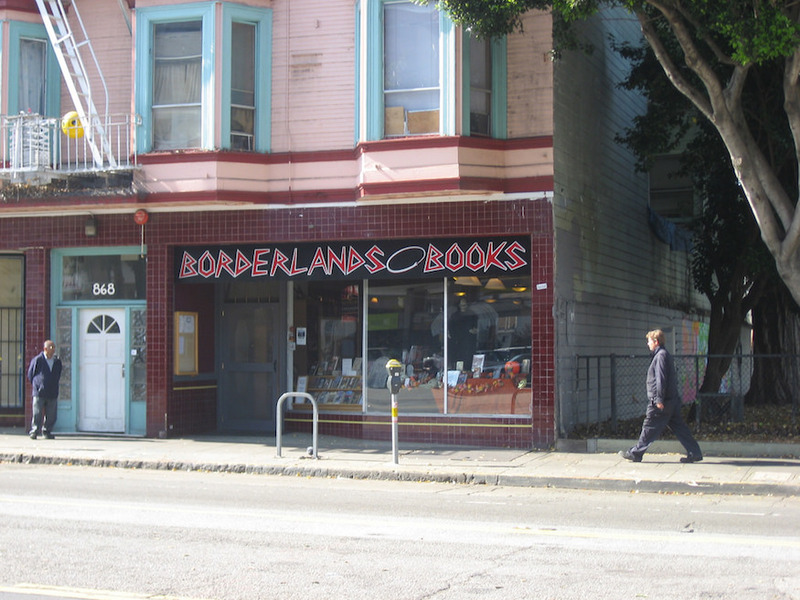 In 2005, I got the opportunity to lease the commercial space next door to my bookstore on Valencia Street. The previous occupants of the space had not been paying their rent and had been a problem for the landlord and so they decided to evict them. And they…they were a little odd. They had this fly-by-night upholstery shop and it was never…there were no posted hours, and it was open infrequently and v ery unpredictably and people kind of came and went at all hours of the day and night. But, you know, it was the Mission, so whatever. But, once the tenants moved out, they left EVERYTHING behind. The basement was aisles of hip-high piles of damaged fabric, wood, and all kinds of junk. And they upstairs was in a similar condition. And I turn to Francis to say, “Hey what do you think of this?” But he’s gone. He’d run back up the stairs. He’s just vanished. Hasn’t said a word. Just turned around and high-tailed it out of there. So, I decided it was time to get some kind of an idea of what the deal is with this place. So, I went down, and I went in, and I looked around: rum bottles, half-burned out cigars, ram skull…and in one corner, there was this section of quite a large tree trunk. If I had touched it, I could have barely got my arms around it. It was about five feet tall, and sitting in one corner. So, I took some pictures and I went back up to the store. And Francis kind of shakes his head and says, “That’s the spirit house. That’s the center-point of the ‘shrine'” [for lack of a better term]. “I don’t know, man. I…like I said: I’m not going back down there,” says Francis. But we had to do something about it. It was in the middle of the basement! We had to do plumbing, we had to get various construction work done. And so, I contacted the landlord. And the agreement that I had made with the landlord was that he was responsible for clearing out the basement, and I was responsible for clearing out the upstairs. And I said that I’ll do the upstairs first, so there’s no obstruction to getting the basement clear. So, I got in touch with the landlord and told him that I got the upstairs done, we need to get the basement clear. So, he hired some guys, down on Cesar Chavez, you know, day laborers. And they all came in, and they were going to basement, and hauling stuff out, hauling stuff out, hauling stuff out. And they’re working right next to the bookstore, so I’m kind of popping in, see how things were going. So, I decided that I didn’t want to deal with that problem. And so we did all of the construction work with the tree trunk, the spirit house from the temple, still in the basement of the cafe. And we just worked around it. We covered it over with a tarp, so it didn’t get damaged or anything like that. And just worked around it. Because, I try to respect other people’s faiths. That’s not one that I particularly (? )…but if someone had left a crucifix in the bottom of my cafe, I wouldn’t have hauled it out to a dumpster, and so I’m not going to do that with a symbol like this either. So, it’s still in the basement at my cafe. Um, 13 years later. And I have no intention of doing anything with it or to it. It can stay there as long as it stays there. But, I’ve managed to keep myself away from any of the bad luck that might possibly be associated with that entire situation. 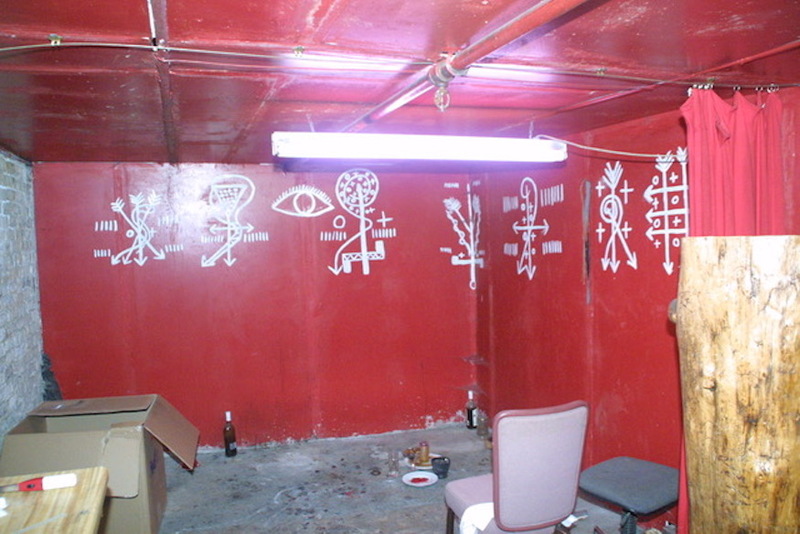 So, there’s still the spirit house from a Santeria temple in the basement at Borderlands Cafe. And it still has the same tarp on it.